I blatantly stole these questions from the 2012 Fantasy Baseball Index magazine's expert poll. Join in the fun by providing your own answers to one, some or all of the questions in the commenting section. NL- Rafael Betancourt (not because he lacks skills but because the Rockies are already grooming his replacement). Convince us that we should spend money (or not) on Yu Darvish. Are we just supposed to ignore that no system for translating performance from Japan to MLB seems to get it right? Is Daisuke Matsuzaka the most important piece of evidence we have or not, and why? Spend it but within reason. I see Yu Darvish as a potential front line pitcher, a top ten type of guy. I see his downside as still slightly better than league average. In an AL-only I'd be willing to bid into the low to mid 20's. Darvish's situation is nothing like Dice-K's. Matsuzaka came to the Red Sox and rather than be happy with what they had, they tried to change him into their version of what he should be. They made him change his workout routines, reduced his use of his change-up, and then didn't support him publicly when he failed to be an ace. In addition, Darvish isn't like a lot of japanese pitchers. He doesn't rely on hesitations and other forms of deception. I also have a ton of faith in the scouting, evaluation and teaching skills in the Rangers organization. They put a lot of work into Darvish and being certain he was the pitcher they wanted to spend 100 million dollars to acquire. This might be the largest factor in my faith that Darvish will perform as expected. What is your strategy for saves? I usually refuse to spend top dollar on closers. If a closer or closers don't go into my acceptable range I will just dump saves during the draft or auction. I used to practice buying next year's closers but this strategy has become so popular that it is sometimes cheaper to just pay for this year's saves. Every expert is still holding out hope for some struggling (or apparently failed) prospect. Who is your guy and why is this his year? I have a few I'm willing to bet on - Jason Heyward and Brain Matusz are two. Heyward was hit hard by injuries. He has worked hard this winter. He has radically changed his diet and workout habits for the better. He has tremendous natural talent as well as advanced skills with the bat. With health, those talents and skills should be on display in 2012. Matusz was, not so long ago, considered one of the better pitching prospects in the game. He suffered a couple of injuries that contributed to his loss of velocity. He re-gained most of his fastball towards the end of the season but the control was still a bit behind. I think he'll be fine. The Orioles believe the same thing if that matters to you. Fill in the blanks in 50 words or less: Everyone is missing out on ______ (secretly valuable fantasy player) because _______ (esoteric expert reason). Everyone is missing out on Chris Heisey because of the mistaken belief that Dusty Baker would prefer to play the mediocre Ryan Ludwick instead. Dusty does believe in easing youngsters into starting roles, but he has no problem putting more experienced players on his bench. Ludwick was acquired as depth and protection, not as a better option than Heisey. 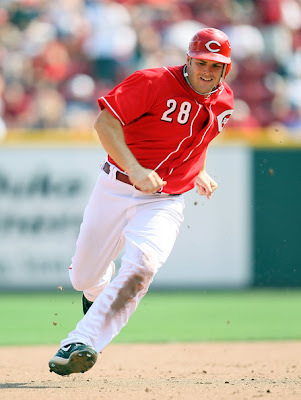 Heisey has 20/20 potential this season and even 30/30 if everything breaks right for him. Yet he is being drafted in the very late rounds (if at all). This is the year for the Reds and Chris Heisey. Which reliever turning starter would you draft first and why? The candidates have to be Neftali Feliz, Chris Sale, Daniel Bard, and Aaron Crow. I actually like them all to some degree but the one I am most willing to bet on would be Neftali Feliz. Feliz has the highest ceiling, the most success as a starter in the minors, and the best pitching coaches. I'd take Daniel Bard second, Chris Sale and close third, and Crow brings up the rear.